On September 5, 2018, Mr. Shinzo Abe, Prime Minister of Japan, held a summit meeting with H.E. 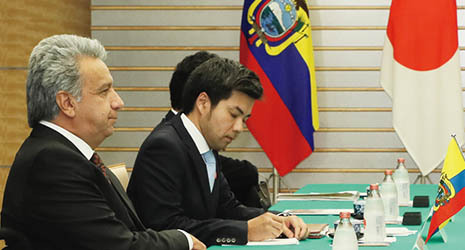 Mr. Lenín Boltaire Moreno Garcés, President of the Republic of Ecuador, who was making an official working visit to Japan. Prime Minister Abe expressed his happiness at being able to welcome President Moreno to Japan this year, which is the 100th anniversary of the establishment of Japan-Ecuador diplomatic relations, and expressed his respect for the political and economic reforms that President Moreno is actively pursuing. In addition, Prime Minister Abe explained that, at the occasion of this President’s visit to Japan, he hopes to develop the relationship between the two countries in a large number of areas, including political and economic relations and people-to-people exchanges, toward the next century. In response, President Moreno expressed the view that the 100th anniversary of the establishment of diplomatic relations is a beginning for both countries, explained that he is happy to visit Japan, which is a model for many countries, and expressed gratitude for the welcome he received. Prime Minister Abe noted that high-level exchanges are continuing this year, beginning with Cabinet ministers and Diet members, and expressed his intention to further advance cooperation. In addition, with regard to the development cooperation field, Prime Minister Abe welcomed that they were able to sign the exchange of notes on the provision of 70 million USD of loans for electricity distribution, the first such financing in approximately 20 years, along with explaining that Japan will continue to cooperate in the fields of disaster-prevention and human resources training that are needed by the Ecuadorian side. President Moreno began by expressing his condolences over the damages caused by recent typhoon (Typhoon No. 21), and then mentioned bilateral exchanges such as Dr. Hideyo Noguchi’s research in Ecuador, and noted that Ecuador and Japan share views on a large number of challenges such as disarmament, the environment and human rights. President Moreno also expressed gratitude for the cooperation extended by Japan thus far, and expressed expectation over ongoing cooperation from Japan in the field of the economy. Prime Minister Abe conveyed his congratulations on the appointment of H.E. Mrs. Maria Fernanda Espinosa Garcés, former Minister for Foreign Affairs and Human Mobility of Ecuador, as President of the United Nations General Assembly (UNGA) for the 73rd session, and the two leaders shared the view that they will deepen the cooperative relationship in the UN. They also exchanged views on regional affairs, including North Korea. With regard to North Korea, they confirmed the need for the complete, verifiable and irreversible dismantlement (CVID) of all weapons of mass destruction and ballistic missiles of all ranges by North Korea. In addition, they shared the view that they will continue to coordinate toward the full implementation of UN Security Council resolutions. Prime Minister Abe sought understanding and cooperation on the early resolution of the abductions issue, and obtained the support of President Moreno.